Opuntia is one of the most numerous of the cactus genera. It is also the most widespread. Opuntias are distinguished from all other cactus genera by having flattened joints or pads called cladodes. The young pads produce small leaves that quickly fall away. 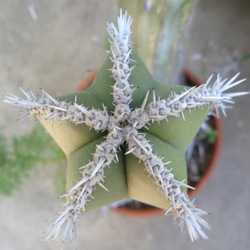 Most opuntias have typical cactus spines and all have glochids, which are tiny hairlike spines that are usually easily dislodged from the plant. The image at the right shows an opuntia with long spines and very numerous short glochids. The flowers come in shades of yellow, orange, and pink. The fruits - the prickly pears - are usually fleshy. In spite of the spines, opuntias are a source of food and water for desert wildlife. It is estimated that 25% of the diet of deer in Texas consists of prickly pear pads. Ranchers will burn away the spines to allow cattle to eat the plants, especially in times of drought. Opuntias are also a source of food for humans. Opuntia ficus-indica is the species most often used. The fruit is called a tuna in Latin countries and is eaten as-is, boiled down to make a brown substance called 'cheese', or boiled down and crystallized to make sugar. The young pads are also edible. They are called nopales or nopalitos. Spines and glochids have to be removed before eating, of course. Both tunas and nopales can sometimes be found in supermarkets in the southwestern United States. Jars of sliced nopalitos can sometimes be found in the Mexican food section of stores. Various species of opuntias are also used medicinally. Some of the more common uses by Native Americans are to apply the juice or a poultice to wounds and to apply heated joints to a new mother's breast to stimulate the flow of milk. 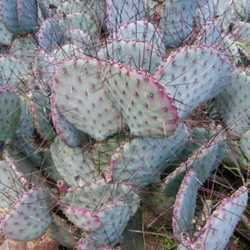 Although opuntias are native to the New World, people in Asia have adopted Opuntia dillenii as a medicinal plant. In India, it is used to trees sores, pimples, and syphilis. In Thailand, the plant is used for stomachache, gas, and liver and spleen problems. The Thai hill tribes also believe that the plant will deter evil spirits and plant it by their homes. Opuntias can also be used to form a living fence. In 1961, the Cuban army planted 8 miles of opuntia fence along the border with the Guantanamo Bay Naval Base to keep Cubans from escaping to United States territory. Opuntias are used in dyeing. 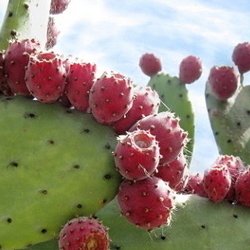 They are the food source of cochineal insects which are used to produce a red dye. The cactuses themselves are also used directly in dyeing. Fruits of various species have been used to color such things as ice cream, juices, and hemp rope. Juice from fruits was also used as face paint by the Seri. 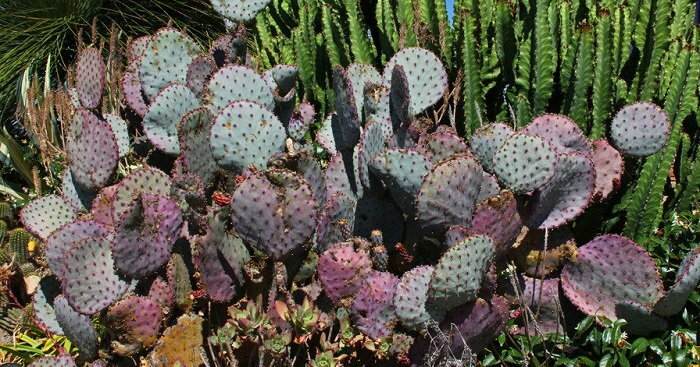 The Blackfoot tribe used mucilage from Opuntia polyacantha to fix the colors of dyed fabrics. Nearly every region of the lower 48 states has at least one opuntia species that is native. Opuntia fragilis is found in the cooler parts of the Midwest and into Canada. This is the northern-most-growing cactus species and is hardy down to USDA zone 4a. Opuntia humifusa occurs widely in the eastern United States and is hardy down to zone 4b. Opuntia polyacantha is found throughout much of the western United States and ranges from Canada into Mexico. A few of the many species in the American southwest include Opuntia engelmannii, Opuntia chlorotica, Opuntia basilaris, and Opuntia littoralis. Unfortunately, opuntias can be weeds, especially when introduced outside of their natural range. It was estimated that in Australia in 1925, opuntias infested nearly 62 million acres. The Australian government sent researchers to the New World to see if any natural control could be found. It was found that the Argentine moth borer (Cactoblastis cactorum) was an effective control and within 10 years after the introduction of the insect, 90% of the cactus plants had been killed and the infestation of opuntias was no longer a problem. Different insect predators have been effective in different areas. In South Africa, the cochineal insect (Dactylopius opuntiae) was found to be the more effective predator. In Hawaii, a combination of both insects eliminated the opuntia infestation. Opuntias can be desirable and are used horticulturally. The shape of the plants is interesting and the flowers are pretty. The color of the pads ranges from true green to yellow-green to blue-green, to purple. Find a plant suitable for your climate zone and plant it in full sun in well-drained soil. Perhaps the most common opuntia used as a house plant is bunny ears (Opuntia microdasys). Potted plants stay small. The species has many short tufts of golden glochids that have a decorative polka dot effect. Variety 'Albispina' has white glochids. Opuntia is a cactus genus of great variety and many species. They are popular for desert and xeriscape gardens. They are found all over the New World and chances are, there is a species that is right for your climate. Just be aware of spines and glochids when planting beside well traveled walkways and where small children or curious pets play.